Here are some snazzy birthday facts about 5th of September 1946 that no one tells you about. Don’t wait a minute longer and jump in using the content links below. Average read time of 9 minutes. Enjoy! What day was my birthday Sep 5, 1946? September 5, 1946 was a Thursday and it was the 248th day of the year 1946. It was the 36th Thursday of that year. The next time you can reuse your old 1946 calendar will be in 2019. Both calendars will be exactly the same! This is assuming you are not interested in the dates for Easter and other irregular holidays that are based on a lunisolar calendar. There are 137 days left before your next birthday. You will be 73 years old when that day comes. There have been 26,526 days from the day you were born up to today. If you’ve been sleeping 8 hours daily since birth, then you have slept a total of 8,842 days or 24.21 years. You spent 33% of your life sleeping. Since night and day always follow each other, there were precisely 899 full moons after you were born up to this day. How many of them did you see? The next full moon that you can see will be on May 18 at 21:13:00 GMT – Saturday. Fun stat: Your first one billion seconds (1,000,000,000) happened sometime on May 14, 1978. If a dog named Demetra - a Cockapoo breed, was born on the same date as you then it will be 308 dog years old today. A dog’s first human year is equal to 15 dog years. Dogs age differently depending on breed and size. When you reach the age of 6 Demetra will be 40 dog years old. From that point forward a small-sized dog like Demetra will age 4 dog years for every human year. Alexander Farnese’s army forces Henry IV of France to lift the siege of Paris. Wedding of Louis XV and Maria Leszczyńska. War of 1812: The Siege of Fort Wayne begins when Chief Winamac’s forces attack two soldiers returning from the fort’s outhouses. American Civil War: The Potomac River is crossed at White’s Ford in the Maryland Campaign. François Achille Bazaine becomes Marshal of France. Spanish Civil War: Llanes falls to the Nationalists following a one-day siege. Camp David Accords: Menachem Begin and Anwar Sadat begin peace discussions at Camp David, Maryland. What does my birthday September 5, 1946 mean? 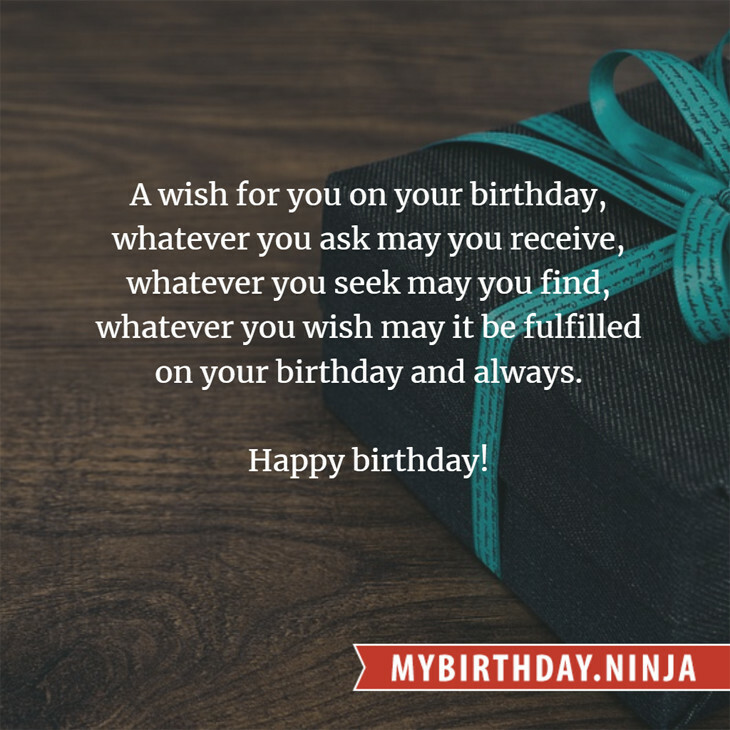 Your birthday numbers 9, 5, and 1946 reveal that your Life Path number is 7. It represents analysis, awareness and understanding. You are the searcher and the seeker of the truth. The following celebrities also have the same life path number: Nick Searcy, AJ Lamas, Barbara Windsor, Howard McNear, Kate Fleetwood, Bill Nelson, Gülben Ergen, Taylor Swift, Mille Petrozza, Chu Sang-mi. 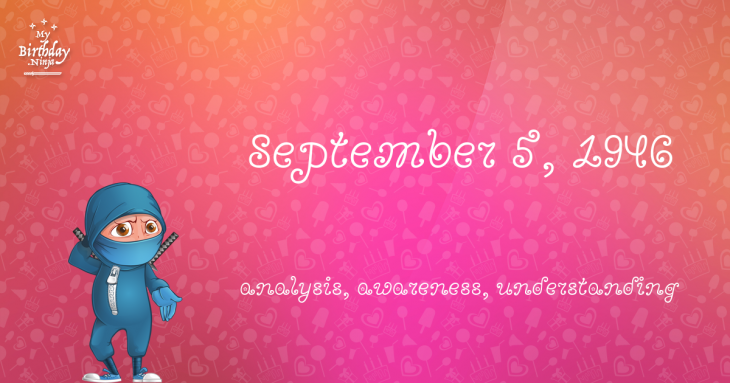 What is the birthday horoscope for Sep 5, 1946? The Western zodiac or sun sign of a person born on September 5 is Virgo ♍ (The Maiden) – a mutable sign with Earth as Western element. The ruling planet is Mercury – the planet of communication. According to the ancient art of Chinese astrology (or Eastern zodiac), Dog is the mythical animal and Fire is the Eastern element of a person born on September 5, 1946. Fun fact: The birth flower for 5th September 1946 is Aster for memory. What is the Love Match for Sep 5, 1946? When it comes to love and relationship, you are most compatible with a person born on February 14, 1946. You have a Love Match compatibility score of +120. Imagine being in love with your soul mate. On the negative side, you are most incompatible with a person born on March 9, 1932. Your incompatibility score is -133. You’ll be like a cat and a dog on a love-hate relationship. Arf-arf, I want to bite you. Meow-meow, stay away from me! What is the popular baby name on 5 Sep 1946? Here’s a quick list of all the fun birthday facts about September 5, 1946. Celebrities, famous birthdays, historical events, and past life were excluded. Try another birth date of someone you know or try the birthday of these celebrities: May 3, 1907 – Dorothy Young, American actress and dancer (d. 2011); June 3, 1942 – Curtis Mayfield, American singer-songwriter and producer (The Impressions) (d. 1999); May 31, 1988 – Lisa Bund, German singer-songwriter.